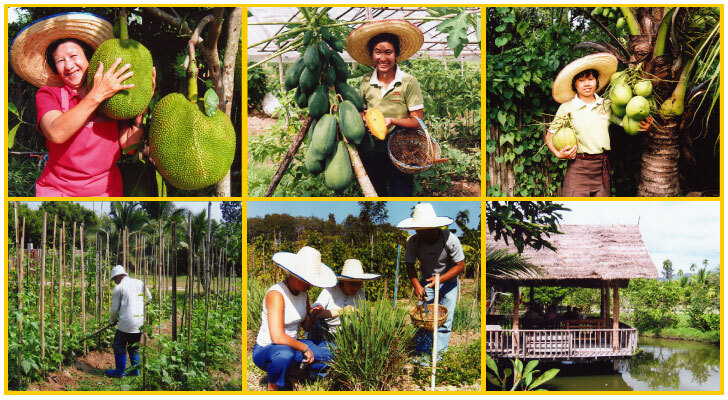 LEARN TO COOK THAI FOOD AT OUR ORGANIC FARM PICK FRESH INGREDIENTS AND COOK HEALTHY FOOD EVERY DAY! You will be able to see many different kinds of organic herbs, vegetables and fruits that we proudly grow ourselves. You will be given the opportunity to pick some of the fresh ingredients that you will use while preparing your favorite dishes in one of our spacious well equipped kitchens. Each person will have his/her own cooking station.Finally, enjoy eating your meal on the terrace overlooking the fishpond where you will have a splendid view of the entire farm as well as the lush nearby mountains. When you partake in a cooking course at the Thai Farm Cooking School, you will become part of the magical world of 1000 trees. Not only will you learn the basics of organic cooking, but you will definately see how a Thai family with many years of experience and resourcefulness creates a self-sufficient and independent farm. We know that your time with us will go well beyond a kitchen setting. It's a truly unique experience raised on a labor of love and much hard work. We care about quality of food and we want to teach other people about it. That is the reason why we have started THE CHIANG MAI THAI FARM COOKING SCHOOL. We want people to know how to cook healthy meals using fresh organic ingredients and enjoy eating Thai food! 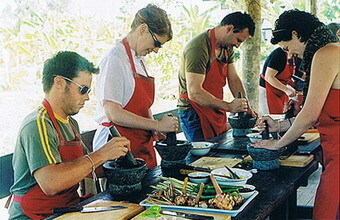 With the basic ingredients and hands-on experience you will be able to cook like a Thai!